My flap controller went bad. I was still getting a readout, but the 0 position was malfunctioning. Programming did nothing to resolve it. It was reading out dashes (---) like when you move it to manual up and manual down, so I pulled the controller out and started reverse engineering it. I know enough about electronics to get myself in trouble, but I am by no means an expert. 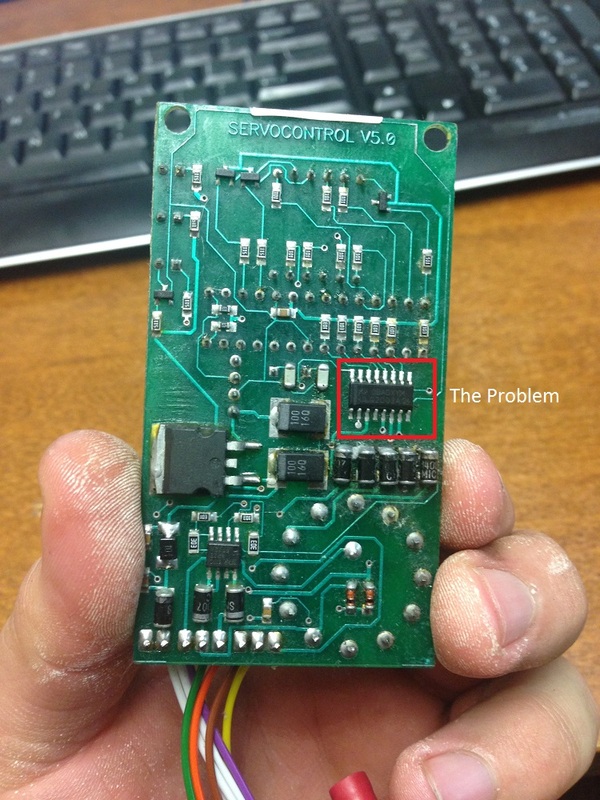 But, I do know that almost every electronic component has an ID on it, so I start IDing things. The small tiny stuff is just generic components like resistors, transistors, etc, but I overlayed text to show what the big important devices are. Turns out, this version of the flap controller only sends 5 positions (-6, 0, 15, 30, 35) to the microcontroller. The other two, manual up and manual down, bypass the board entirely and just send a signal to the relays to roll the motor one way or the other. That's a good clue! That means that when the controller doesn't have a signal, it still provides an indication of some kind! So now, with the voltmeter, I start tracing out some of the pin positions. First, I verify that the rotary switch is actually getting good contact. Uh oh. Nope, not getting good contact on two pin positions, moving the switch causes jitter. It's a pretty generic switch so I just opened it up, clean the contacts, and replaced the wiper. Retest. Still no 0 position, but the flicker is gone now. Back to the bench! After a while of studying this board, I get to one of the chips. There's not much between the switch terminals and the microcontroller, and I've already verified the controller is making good contact. I pull the number etchings off the chip and go look up the datasheet. This chip is a darlington transistor array. I don't know enough about electronics to say what this chip is used for in this circuit design, but the data sheet has a block diagram, and basically it's just amplifying to the corresponding pin on the opposite side. When I start testing the terminals... oh. The 0 position is all wonky on this chip. I take my physical measurements of the chip, comb the datasheets to figure out which version this is (and holy crap, there are a LOT of versions! ), and put an order on mouser for 2 at a whole whopping $0.58 each. Now, these are SMD devices. Surface Mount Devices, if you will. Lots of pins. It's about time I get a real electronics workstation, so I pick up this nice piece for ~180. 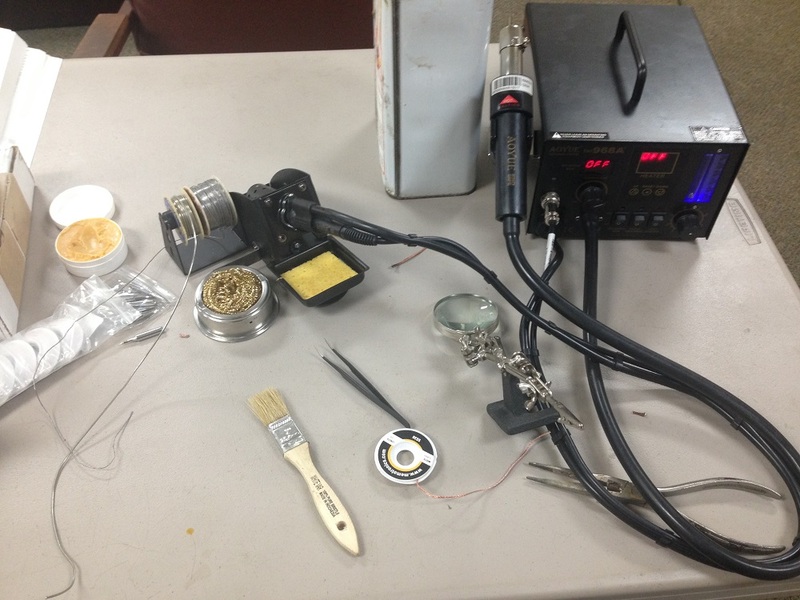 Hot air gun, soldering iron with vacuum, desoldering vacuum, digital control... and lots of tips, including one that will work well for drag soldering. Technically this should be attributed in the cost of repair too, but I've been looking for a reason to buy this anyways! So, I swap out the chip, cross my fingers and plug it in. VOILA! It works! $1300 saved with only a few bucks in parts plus a soldering station that will be used many times more! Now to clean up those diode mounts. My fault because I got things a little too warm near them and they moved a bit, and I moved them back but not very well. I'll be redoing them. Congratulations - that's a great use of limited knowledge to make a fix. Combining limited knowledge with a bit of sound reasoning and a willingness to experiment and learn new stuff can go a long way - I love it. What I don't like is manufacturers charging such astronomical amounts for PCBs that cost literally a few dollars to make - $1300 - come on! R&D costs and low output. It's why a computer motherboard can cost $200 despite requiring EXTREMELY SPECIALIZED knowledge to design that only a few thousand people in the world have, while only a few hundred have the experience. Then add in associated foundry design and specialized knowledge for that too... but they sell so many, that the economy of scale brings the cost down dramatically. Anyways, these flap controllers could literally be made with arduinos. Now, would it be reliable? I'm unsure and unqualified to make such a judgement. Great write up! Anytime you can fix a problem and end up with more tools, is a good day. Corey, in some cases R&D does justify high prices, but that's a simple PCB that any electronics guy could draw out on a napkin over dinner. R& D costs to design that would be negligible to zero. I think the reason for the high price is more like: we have a captive market so we can charge what we want. Of course one doesn't begrudge a good profit, but within reason, please! The same astronomically high prices are commonly charged for PCBs that come out of heavy plant, agricultural machinery and industrial equipment, so it's not just aircraft manufacturers who make exorbitant margins on such items. They do it just because they can. I agree, 1300 is too much. Also, liability. Can't forget that one. Finally, the micro controller has onboard flash memory. It actually has a program on it. One of these days I'll rig up an interface and make a backup copy. Corey, nice going on the flap board. I'd probably have been stumped if I got the "no go" after cleaning the switch. Anyways, these flap controllers could literally be made with arduinos. I agree that the price is extremely high. Similar to the controllers in washing machines. Those sell by the tens of thousands and they still want a usurious $400 - $800 for a replacement. But...this isn't really the "back of an envelope" electronic design. More like a first year Electrical Engineer mid term project. There's conversion from CMOS logic levels to motor drivers in a very noisy electrical environment, plus at least some fail safe consideration. There's specifying the components after the conceptual design. An Arduino could reliably handle the logic, but there would still be the level conversions of the drivers and feedback circuits. These simple little designs can be pretty fiddly in reality. I guess I'm saying the replacement cost is crazy, but FD had to hire an engineering firm to design this board and have the boards built, then they have to stand behind the design legally. 3 wires are for potentiometer position sensing. It uses a standard 10k pot. 3 wires are for relay controls, 1 for up, 1 for down, and 1 common. 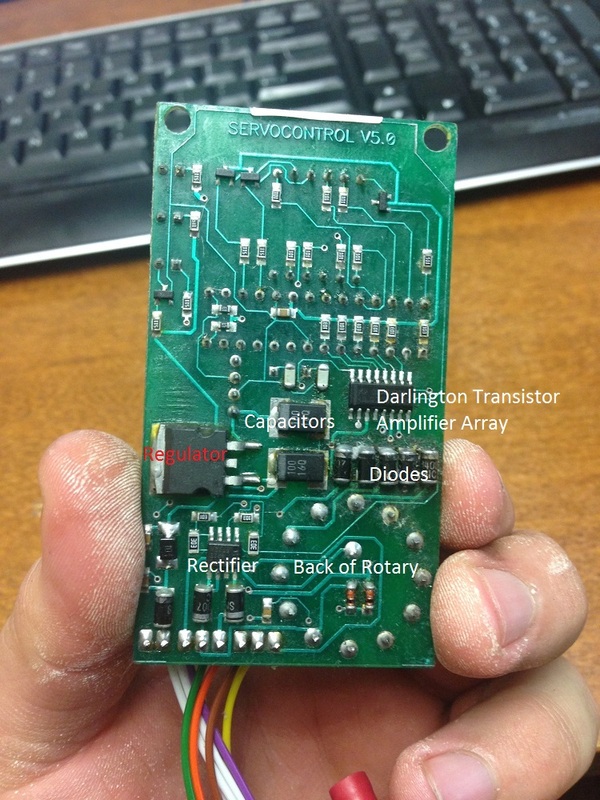 There's a separate board on the firewall that has the relays which controls the motor itself. This is the older flap design. 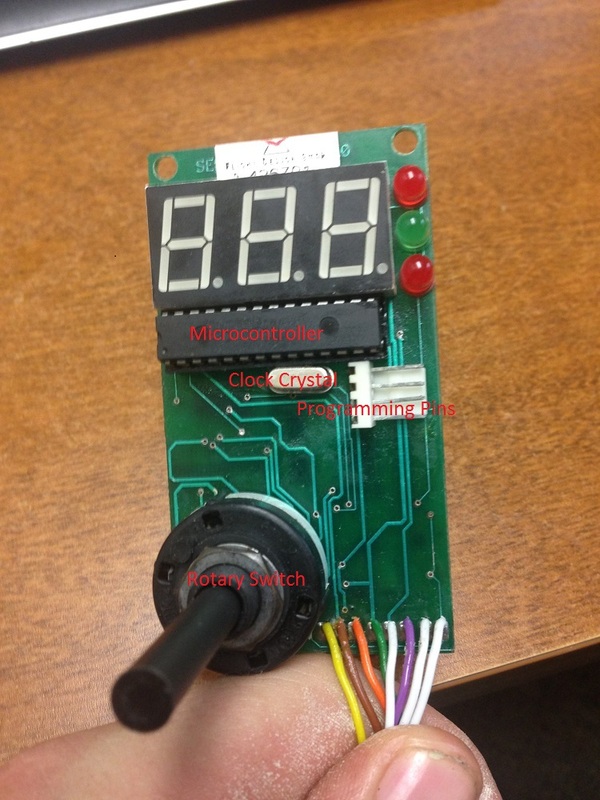 All the arduino would need is some flyback diode protection, rotary switch input, and a segment display. For newer flap systems, a separate relay board is required, as well as current monitoring so that overload protection can be used. Arduinos do have analog inputs that monitor voltage, so a current shunt would work perfectly once calibrated. What I don't know is how well an arduino will function in power surges or temperature extremes.